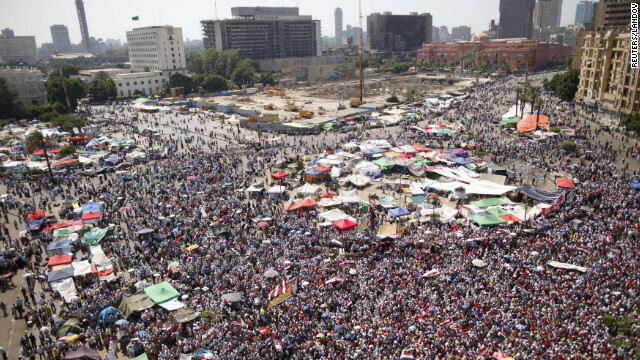 Cairo's Tahrir Square was flooded with people anxiously waiting for election results on Sunday. Around the world Sunday, people waited anxiously for the results of Egypt's groundbreaking presidential election. And the payoff was a long time coming - especially when Egypt's election commission began its announcement of the results, but took an hour to get around to telling who had won. That prompted the Twittersphere to poke some fun at the long, long announcement. Is this speech available in Cliffs Notes? Y'all should rush the stage, shouting Viva la Revolucion, grab the pages out of his hand and read out the results. Khalas. Oh, why, why, why, do we always have to suffer an epic speech before we get to the bloody point. #Egypt. Are you there? Share your images. I thought his name was Gannel. I didn't catch his addy, which is why, of course, CNN deleted it. oops i mean ty banasy? Why are you spelling my name wrong tho? Thats odd. "Bless the children", you say? Are you speaking of God's children, or the children of God's enemies. God's children are precious to him, while he views the children of his enemies as "little dogs", judged by their parents behavior, not their own. Do tell... where does it say that? The scriptures I've read say were supposed to love our enemies. Maybe you're confused about what love is? I wish I could entice you to good works, but someone who would entertain the thought of loving children has a ways to go to come to accurate knowlege. No knowlege… no understanding. Let not a small stone trip you on your way. God loves everyone. Stop trying to convince people otherwise. So, God treats the innocent children of the adults he deems enemies as little dogs? Not the God I believe in. @banasy, it is that type of thinking that makes me repulsed with religion. The whole sins if the father belief. Why would an all loving god hate people who live a good clean life, senior help others, and do work that is financially weak, but helpful to the community, who just happens to think it is necessary to have proof of something before they believe in it. lol ok banasy, ive never noticed you to spell it wrong before. And now you see what im saying about how people interpret things? Of course GOD loves ALL children, what kinda garbage is that anyway? Sounds like IDIOTS R US!! @ Mary, 😉 that was a nice thing to do! The dude that was helping illegal Israeli made weapons find their way through tunnels beneath the Israeli-Egyptian border and on to Mexico, etc. Is this new president also a dude? Roughly 80% of all illegal guns confiscated by Mexican authorities are mae in Irael and the USA. And you blame the FBI. What a joke. LOL.. If you could really stick that long for an announcement that you are waiting so eagerly for, you would know what they felt! It truly wasn't me, and it was very gracious of you to apologize; apology accepted! @banasy. I said the God of the bible VIEWS the children of those whom have made themselves into God's enemies as "little dogs". Your reply insinuated that I said God *treated* them as little dogs, which is not true. God would have to violate his own laws to step-in on behalf of little dog children of Big Dogs. Children are judged by the actions of their parents, not by their own childish behavior. example: When ancient Hebrews whom had sold themselves into slavery to Egypt caame to the Promised Land, God ordered that every single man, woman, AND child of his enemies...the Cannanites...be put to death. Also, when God observed jewish women eating their own babies towords the end of Rome's 4 year siege of Jerusalem, He didn't step-in on behalf of the children who were not his. God's children left with their parents when Roman troops broke siege, and so were not in Jerusalem or the Temple when Rome destroyed it in 70CE. God does, however, make it rain and shine on good and wicked people just the same.